Overall winner: Samsung galaxy note 4! inote46plus, 10 Feb 2015i started using android devices from 2010 up to now, while i used the original iphone up to ip... moreI would say the only reason your note 4 is lagging on that particular app is because the developers of the app itself have not optimized it for newer versionsof operating systems like lollipop or kitkat perhaps. No, it's not ”way better and sharper”. The difference is not that big. - Way better battery life. - SD card, removable battery. - Way better and sharper screen. Insisting on small size phones for many years; apple lost the game and; headed for bigger ones!!!! The same occures for SD memory soon! Apple is good enough; just 5 years behind!! Thats for sure!!! Not mentioning the HDMI out with Note 4 via HDTV samsung adaptor.????? Anonymous, 07 Jan 2015Hey guys iam sorry but please some one tell me which one i should buy because iam confused so ... moreIve been an iphone user for 4 yrs then switched to a note 4 exynos. It feels great when multi tasking. Opening apps at the same time is much cooler. And you can reply to all your chat apps without closing your present app. Go for a note 4 ill say. Challenger_1976, 02 Feb 2015I've been using my iPhone 6 plus for around a week now (upgrading from an iPhone 4). At first ... moreDid you read this and other reviews. 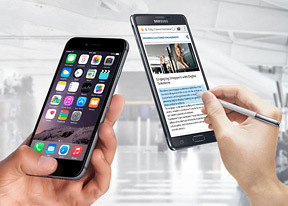 The Note 4 is way ahead of the iPhone 6+. When I bought LG g2 there s no lag, that encouraged me to go for LG g3, when I found lag. Probably because of very very high resolution screen. Then two apps helped me a lot. Second NOVA launcher, if it so fluid, even my wife's iphone 5 may have done lag but not the nova launcher. I agree they are expensive but they deserve tag attached with them. i started using android devices from 2010 up to now, while i used the original iphone up to iphone 4s. the reason i started using android exclusively were the original note and note 2. back then android was getting the flak for being laggy, and it really was from phone to phone i have used then. when i got the note 2 though, everything changed- there virtually is zero lag. i only can guess that those people who still say android is laggy have really not used recent android devices at all. i didn't see any compelling reason for me to upgrade to note 3 so i skipped that and went to have an xperia z ultra instead. back in december i decided to have the note 4, seeing that my note 2 is beginning to show it's age. i got the exynos variant, which is the only one available here in the philippines. i really was blown away with note 4 until i re-downloaded my music production/sketching app that i purchased originally on the note 2. while the app works perfectly fine with my note 2 even up to now, i am noticing some lag when touching a button on the note 4. i thought this was just my unit, but i tested the same app on my wife's note 4 and it is having the same lag. i would say if it is the first time you downloaded the app on the note 4, you probably would not notice the millisecond difference between the time you touched a button before the device makes the corresponding sound and you may have compensated accordingly. this proves irritating for me because in music production, timing and sync are everything. while i still have my note 2 with me, i prefer using my note 4 as my daily driver because of upgraded multi-tasking features. it's just that i think the note 4 is not properly optimized for kitkat; hopefully this would be fixed with the expected lollipop update. additionally, i hope samsung add back the smart rotate and smart scroll. Swipe to scan vs tap to scan is an opinion. I prefer swipe, as it allows a shorter home button. 64 and 128gb versions is COMPLETELY USELESS. Expandable storage allows me to go bigger. AnonD-345496, 26 Dec 2014In the name of single god I think the gpu of iPhone 6 is a monster but camera quality is weakThis week I will buy note 4 .......note 4 is very cool and well designe phone . apple is not for the official purpose too slow as rather than note 4 .apple needs to improve there quality and they need to understand if they increase the size so iphone is cool like samsung . Even if Note 4 has a 16Mp camera compared to iPhone 6 with 8Mp,the performance of IPhone 6 camera is better.